Queensland’s (QLD) top achievement this quarter was winning the silver award nationally for highest median weekly family income growth at 2.5% in the 12 months to June quarter 2018. QLD can boast a superior wage growth this quarter, which many states would be envious of in the current low wage growth environment. 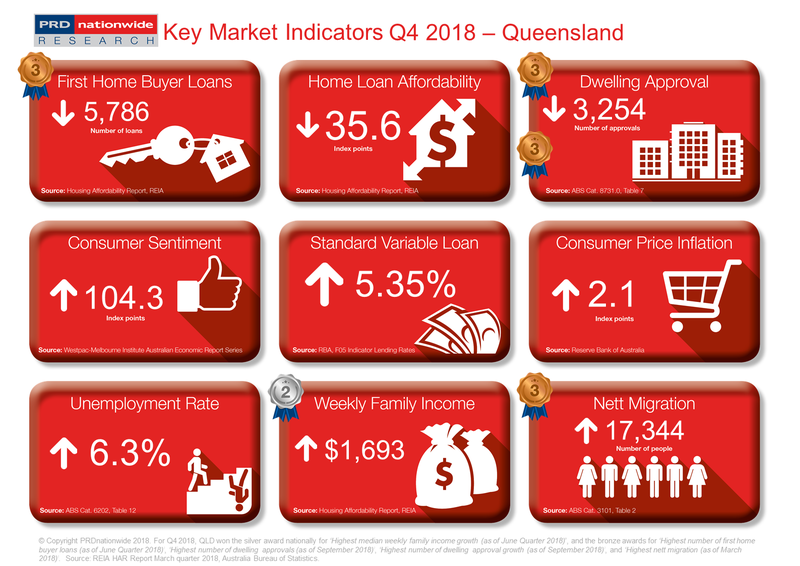 QLD additionally received two bronze awards nationally relating to dwelling approvals, specifically for the highest number of dwelling approvals (as of September 2018) at 3,254 and the highest number of dwelling approval growth (as of September 2018) at -7.1%. Only two markets (Tasmania and the Australian Capital Territory) saw positive growth in this indicator. This suggests QLD has been the most resilient of the larger states in relation to dwelling approval stability, making it a leader in the market in this category.